Including the name of one of the greatest horror novelists of all time in the title, You Can’t Kill Stephen King manages to grab people’s attention for the get-go. However, I’m not too sure that I approve of this farcical movie dragging Stephen King’s name into it in the first place. 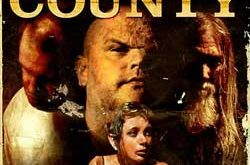 Stephen King is known for quality horror (with the likes of Carrie, Salem’s Lot, The Shining, Misery, It, Pet Sematary amongst many others) and one word which cannot be applied to this film is ‘quality’. It was moderately amusing and funny at times, proving itself to be much more of a spoof than a serious journey into the world of horror – with a title like You Can’t Kill Stephen King, let’s be honest, no one was expecting much! And I find it interesting to see that the promotional photographs for the movie feature all three leading ladies bikini clad and blood covered in true B-Movie style! 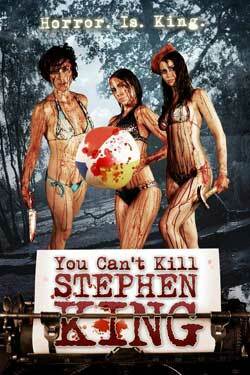 You Can’t Kill Stephen King tells the story of a group of young adults who go on holiday, hoping to have good times and possibly meet Stephen King. Events then turn nasty as they begin to get killed off one by one in a conventional slasher manner. Initially thought to be the work of some feral animal, the group (or what’s left of them) start to question this notion, eventually turning on each other. Each of these characters is a clear stereotype which is featured in most recent horror films – we have the nerdy virgin, the shallow ‘princess’, the cute, loved-up couple, the bitchy older sister and the token black guy who we all know will be the first to go. However, instead of trying to be sneaky at these obvious clichés, You Can’t Kill Stephen King rather embraces them with overt introductions at the very start of the film. True, a lot of the conversation that takes place between them is pretty inane and there are a tad too many masturbation gags, but I find this to be perfectly congruent with what this film is supposed to be. Ultimately, the main goal of the film is to be funny, not scary. It takes a fair while before anything actually ‘horrific’ takes place, and there’s a nice smattering of blood when it does. But it never succeeds in moving the audience in any way when it does because the whole film has been so tongue-in-cheek that we don’t care about the characters. To be honest, some of the characters were so annoying that they couldn’t have been killed fast enough, quite frankly. I wouldn’t want to make comparisons to Scream, because I think Scream worked a thousand times better at getting the balance between comedy and horror just right, but I also don’t think it’s really comparable to Scary Movie either because it does seem to try to have some genuinely scary moments. I am possibly even reminded of The Cabin in the Woods for its self aware look at the horror genre, what with the overuse of horror tropes throughout. However, You Can’t Kill Stephen King is nowhere near as good as any of these other, established ‘horror’ films so keep your expectations low for this one. To conclude, don’t watch You Can’t Kill Stephen King with any hope for an innovative, artistic piece of film, because it definitely isn’t! However, if you like low budget, light hearted movies whose sole purpose is entertainment then it might be of interest for you. Especially if you are already a Stephen King fan, as you might take some enjoyment in spotting the various homage’s to his characters throughout. And I’m telling you right now, in case it isn’t already obvious – no, Stephen King doesn’t make a cameo appearance (we get a pair of glasses and that’s it)!